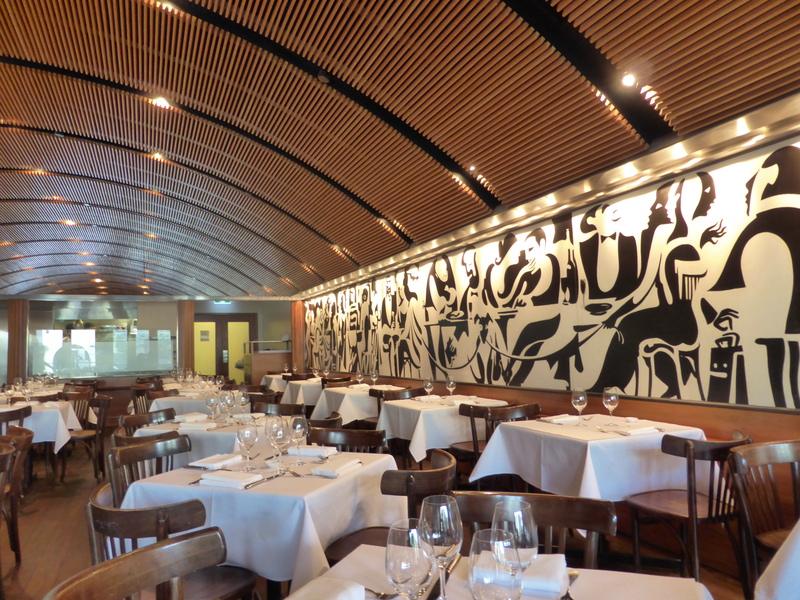 Bistro Moncur is quite an institution in the Eastern Suburbs. Many families come here for Sunday lunches to be served by attentive and friendly staffs. Bistro Moncur is also my family’s favourite. I like coming here for the familiar surrounds and also because I can mentally summise what I would be ordering without consulting their menu. Their long-standing signature dishes are fish soup, salt cod brandade, grilled sirloin and pork sausages, which are smackers. To cater for the many regulars, they have also have a ‘specials of the day’ menu for more innovative seasonal dishes. 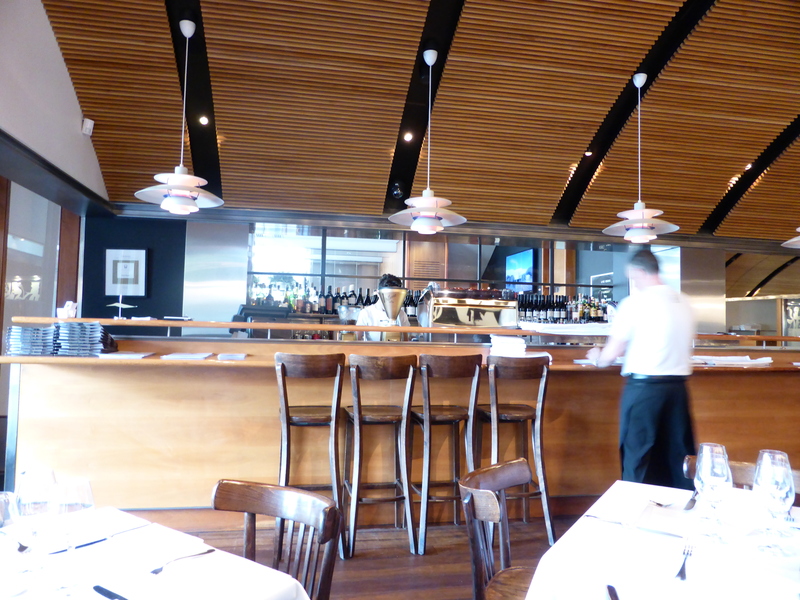 The restaurant is located inside Woollahra Hotel, an iconic art deco building which also houses a TAB where one can get a lighter and more casual fare. The curved interior of the restaurant is made up of a series of timber joists with fabric underneath. I am guessing this is for sound insulation purposes for a busy restaurant with hard surfaces such as the hardwood floor, mirrors, and bricks. In any regards, the noise level was low, moreover, I have noticed from my stay overseas is that the children here tend to be very well-behaved without the howling and running amok that the kids in Asia do. (Having said that, a little girl did fell off her chair while trying to grab a fork but she did not make a racket, but got back on her chair quietly). Read up on the conservation and refurbishment project here. 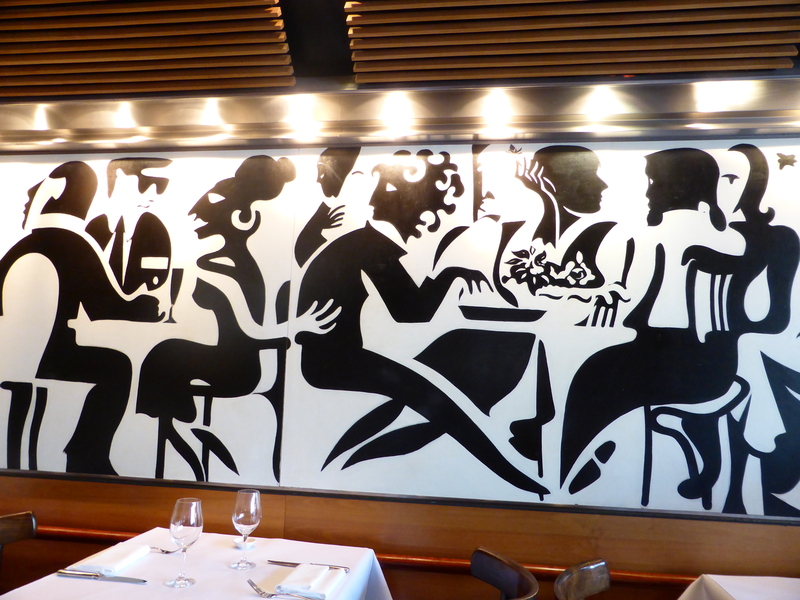 The black-and-white Matisse-inspired wall murals by Michael Fitzjames adorned one side of the wall depicting humorous tales of the diners out in a restaurant e.g. 2 lovers dining in different tables next to each other, a pick-pocket lifting a wallet out the pocket of an unassuming diner among the few. This made for very interesting visuals. Help waiter, there’s a snake in my salad! 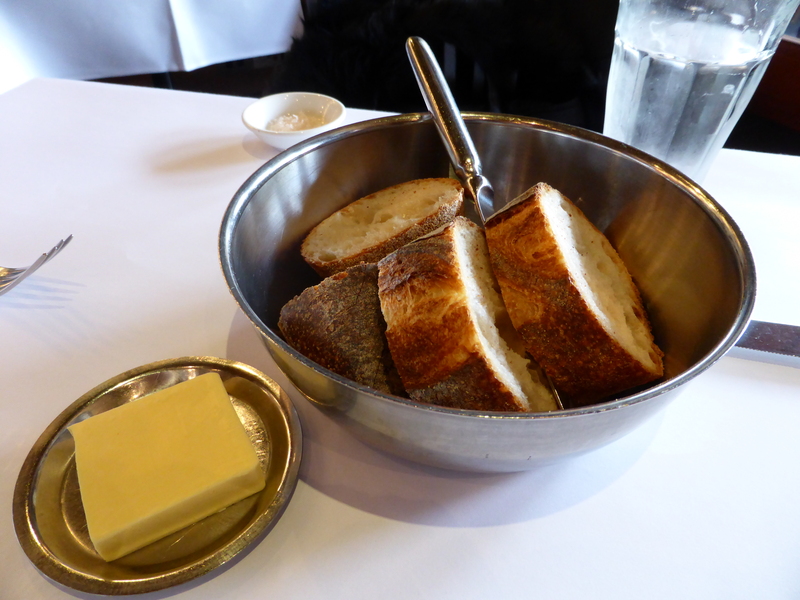 Complimentary crusty sourdough bread. I like sprinkling some salt over the buttered bread for an extra salty crunch. My Bro’s usual is the Grilled Sirloin Cafe de Paris and Frites ($43.50 – wow, talk about inflation, it was $35 a few years back!). 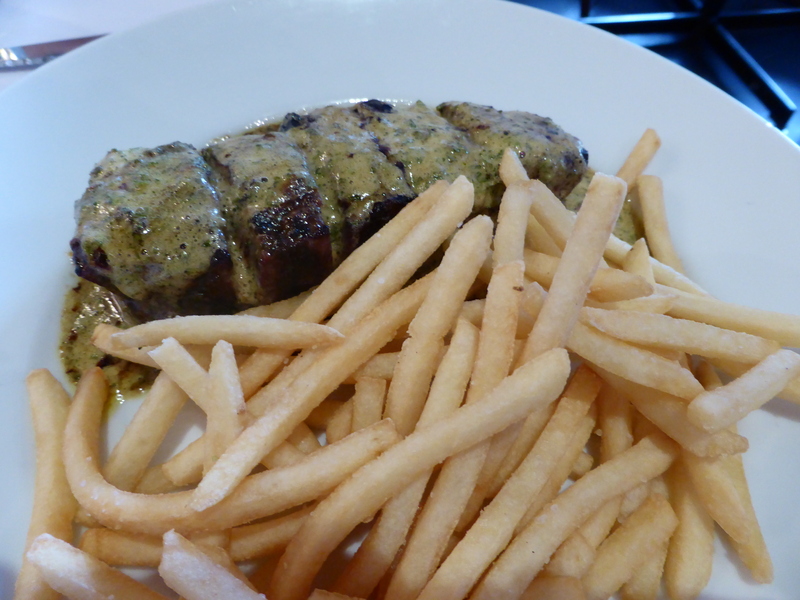 This is the Classic Parisian fare of steak and chips which is a fixture and signature of Bistro Moncur. The julienned frites are another hallmark of Bistro Moncur’s classic French cooking of potatoey goodness enveloped by the crispy shell. The taragon butter sauce drizzling the steak is a perfect accompaniment. 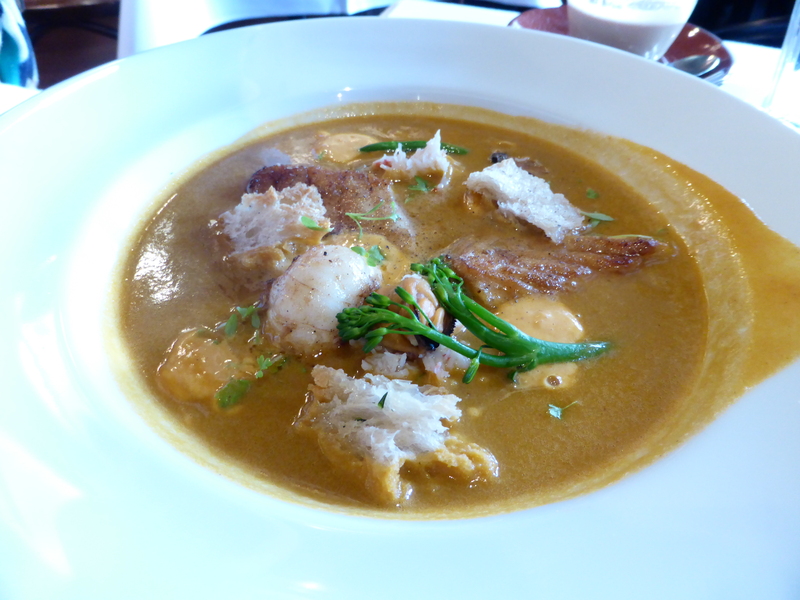 Mom’s Bouillabaisse was one of the specials for the day. It was a very rustic hearty fare perfect for a cold wintry’s day. There was a lot of seafood in it, thus smelt very strongly of seafood. Needless to say, she was the last to finish. 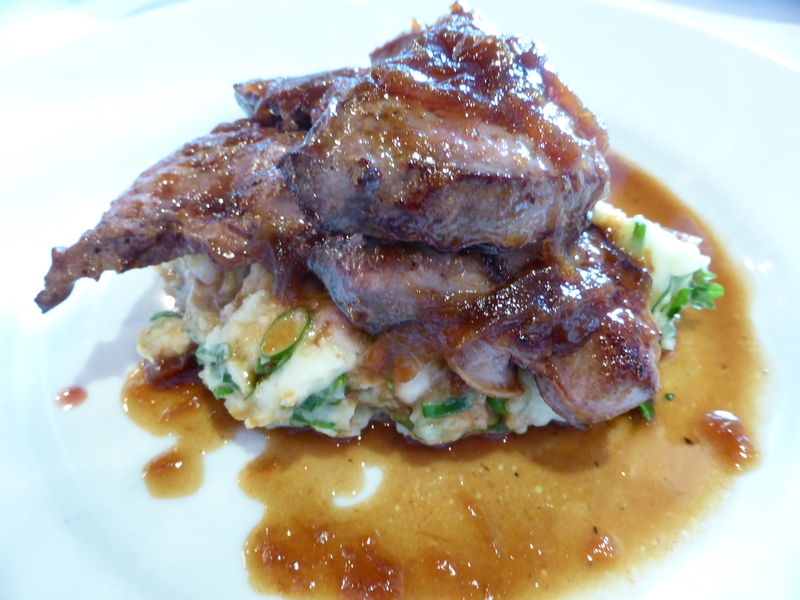 My Calves Liver was also another special of the day. The pan seared livers cooked in caramelised onions imparts a sweet tangy taste. Although the livers were seared with the insides still pinkish, the liver was tough and a tad too chewy. The bubble and squeak of cabbage, parsley, peas, ham and potato mash was delicious, I could not resist finishing them up. 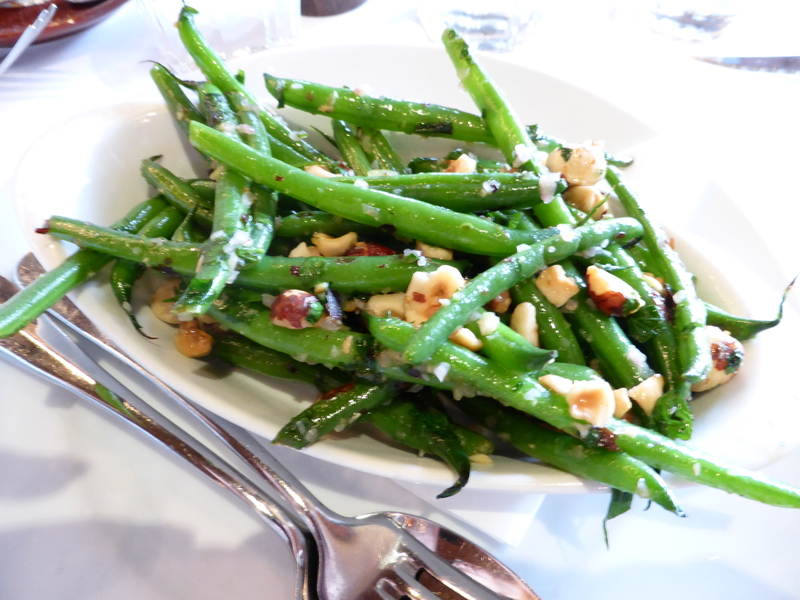 We normally order a bowl of shoe-string fries to go with our meal, but decided to have a side salad of green beans with hazel nuts and eschalots instead. I can’t recall the waitress’s description of the beans, but needless to say, the long beans were very crunchy, the hazel nuts freshly roasted and the bitsy pulps of the tangy lemon balanced the grassy dish with a kick of acidity. The tarte tartin and soufflé in Bistro Moncur are very famous, but today we decided to go for something different. 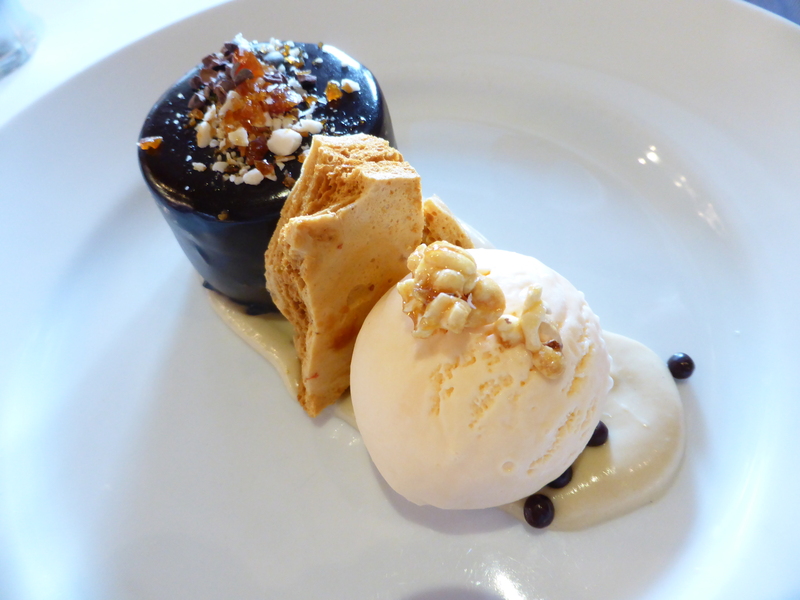 My Bro chose Peanut Butter & Milk Chocolate Delice, popcorn ice cream and Banana Puree ($16.50). I did not get to taste, but since he left a clean plate, I was left in no doubt that he enjoyed it very much. I noted that the milk chocolate mousse was covered in dark chocolate ganache, and sprinkled with bits of caramel brittles and nuts. The Honey comb was set between the mousse and peanut butter ice-cream with pop corn on top. Mom and I shared the deconstructed ‘Choc Mint Slice‘, which was an assembly of chocolate ganache, lime sorbet, mint sorbet, salted caramel and choc chip crumble. 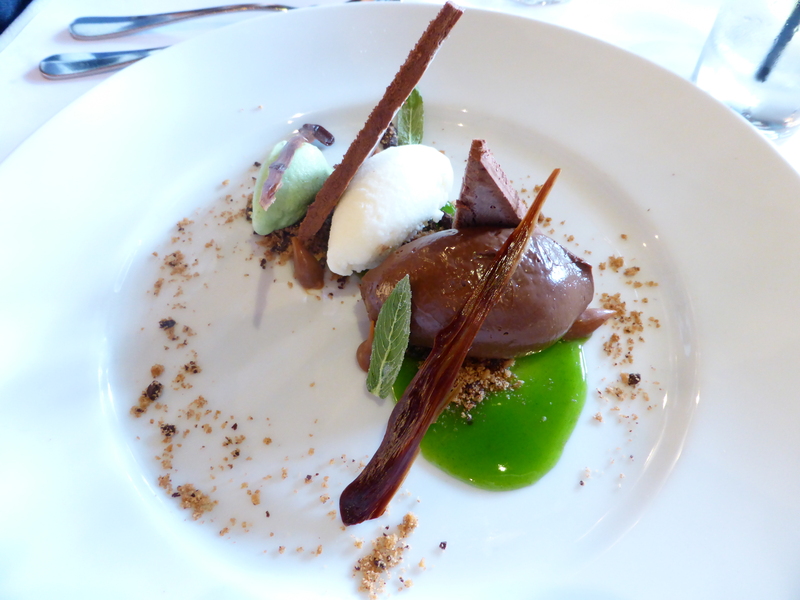 I especially enjoyed the thick fudgey chocolate mousse and slivers of brittle tempered chocolate. To finish, and to balance out the sweet dessert, I had a Long Black. 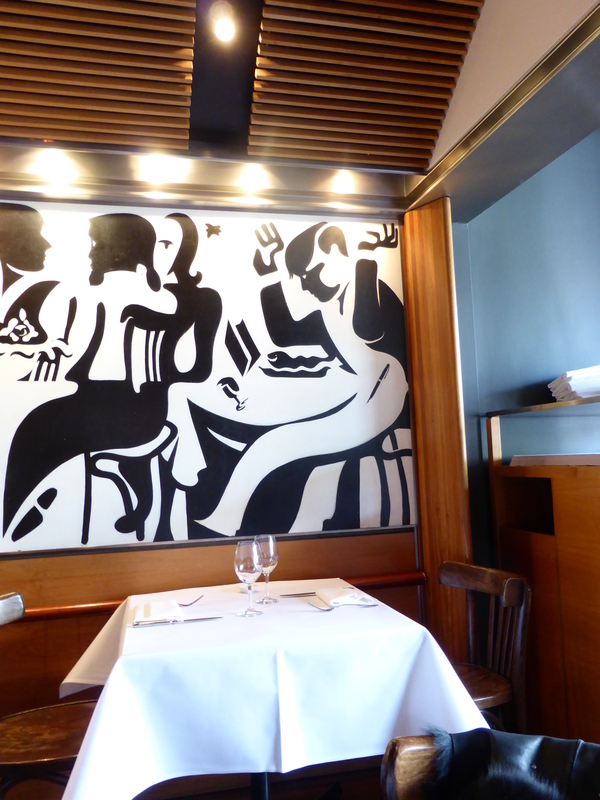 This entry was posted in Fine Dining, Sydney and tagged Bistro Moncur, Calves Liver, Classic French Bistro, Grilled Sirloin Cafe de Paris and Frites, One Chef Hat, Peanut Butter Ice-Cream, Restaurant Interior Design, SMH Good Food Guide 2009-2013, Woollahra. Bookmark the permalink. believe it or not, my fav is liver. 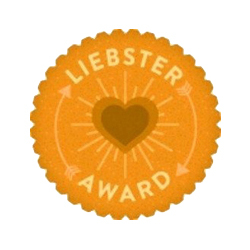 Very few people like liver, but I do… liver spread, liver steak, liver adobo, liver in noodles, liver in beef stew, liver sauce for grilled pork. I love liver spread in my sandwich… Reno Liver Spread. Oh, cholesterol ! Aaargh. I know . I’m counting calories, though, which isn’t fun. Hi Rosa, I think probably mid-1980s. You should google Damien Pignolet, the original owner and check out his trails. All the best on your article!